DRA switching actuators with integrated bus coupler. For switching independently controllable groups of loads. 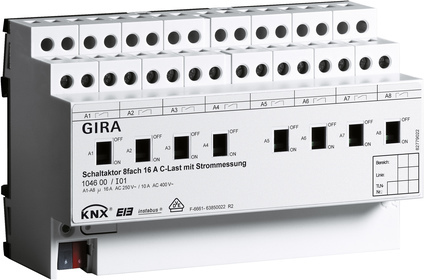 With manual switch for switching over the relay (On/Off) parallel or without KNX operation. Multi-phase connection. No additional power supply required. Manual actuation of the relay independent of the bus or switching position indication. Feedback can be delayed until after the recovery of bus voltage. Time functions (switch-on/off delay, staircase light function – also with advance warning function). Integration in light scenes is possible, eight internal scenes at the most can be parameterised per channel. Elapsed operating time meter as forward/backward counter with limit function (limit can be changed via bus) can be activated for each output. Input monitoring for cyclical updating with safety setting. Reactions in case of bus voltage failure and restoration can be set for each channel following an ETS programming process. The switching contacts of the switching actuator, 8-gang, C-load are especially designed for loads with a capacitive character, and therefore conditional, brief, high switch-on currents (see Technical Data). The switching actuator has an integrated current detection. A current measurement can be carried out for each channel. Current detection: Measurement of load current for each channel. Threshold values for load monitoring (e.g. signalling of load failure). Independent switching of the eight outputs.